Cyprus trip, beginning on Friday, is it a political minefield for Holy Father or a chance to shine spotlight on Middle East? THE SCO is delighted that Girls Aloud singer Nadine Coyle is lending her support to a Glasgow-based businesswoman’s unique firm. The Irish singer has become an ‘ambassador’ for Vanilla Blush owned by Nicola Dames. The firm, recently featured in the Scottish Catholic Observer, makes specialist underwear and swimwear for people who wear stoma (colostomy) bags. Ms Coyle, 21, decided to help Vanilla Blush after her friend, hairstylist Connor Grant, had an operation in January which resulted in him needing a colostomy bag. “This was a big worry, especially in our industries where there is so much pretence at body perfection,” Los Angeles-based singer Ms Coyle said. Young Mum Mrs Dames, a former neuro intensive care nurse and a huge lingerie fan, began her business after she had surgery in Glasgow in 2006 which meant she was required to wear a stoma bag. After surgery she realised none of the underwear available fitted or helped her feel good about her body so she designed her range own with a special concealed pouch. Mrs Dames hopes the singer’s endorsement can help Vanilla Blush crack the American market this year. The businesswoman want to take her lingerie, swimwear and models, who all wear stoma bags, to a nursing conference in Arizona and is busy raising funds for the trip. IF YOU go down to the woods, I mean St Margaret of Scotland Hospice today you are in for a big surprise. Glasgow-born singer Darius Campbell is visiting St Margaret’s this afternoon ahead of a fund raising lunch for the hospice on Sunday. The critically acclaimed West End actor and platinum-selling singer-songwriter, formerly know as Darius Danesh, is sure to put a smile on the faces of staff and patients at the Clydebank facility—and on the faces of those ladies who are lucky enough to be lunching with him at the RAS Radission Hotel in Glasgow this weekend. 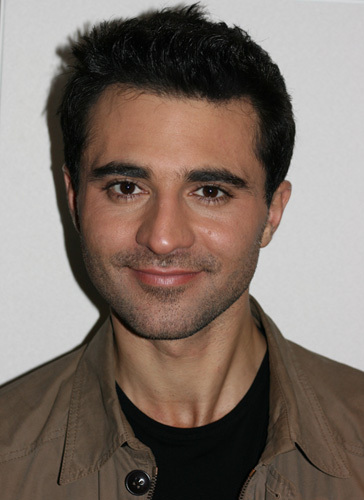 In breaking news, Darius, who recently won the TV show Pop Star To Opera Star, will appear at the King’s Theatre Glasgow as Prince Charming in Snow White And The Seven Dwarfs this year’s pantomime. The singer recently played the role of Escamillo in Bizet’s Carmen at London’s O2 Arena on May 23. Just 13 months after he visited the Holy Land, Pope Benedict XVI will give Christians in the Middle East his full attention again as he visits Cyprus June 4-6. Los Angeles officially welcomed its next Roman Catholic archbishop, Jose Gomez, on Wednesday with a celebratory Mass that included a bit of just about everything: tears, drama, majesty, song, hats, incense, a cast of thousands, prayer and even a little slapstick humor. Two senior Catholic Church officials in Canada did something remarkable this week…They proposed a way to re-frame the discussion about abortion and it would be to the benefit of many to pay attention to what they had to say before dismissing them because they wear clerical garb. NEWLY released figures—that show abortions have fallen in Scotland for the first time in six years—are to be celebrated, but they do not tell the full story. More than one-quarter of women having an abortion in Scotland have had a previous termination, according to figures released by ISD Scotland—the official publisher of statistics. Coming in the week where the first television advert for abortion was broadcast on British television, the figures make for grim reading. Last year 13,005 abortions were performed compared to 13,817 in 2008. The number had been rising each year since 2002. Geographically, Tayside tops the league for rates of abortion at 15.9 per 1,000 but abortion rates in the most deprived parts of Scotland was 16.5 per 1,000 among women aged 15 to 44, almost double the rate of 8.8 per 1000 in the most affluent areas. The number of abortions carried out in the Lothians fell from by 200 to almost 2,500 but one schoolgirl every week is still undergoing a termination, according to Edinburgh Evening News. On a more positive note, pro-life campaigners continue to fight the good fight. Sr Andrea Fraille of the Sisters of the Gospel of Life is travelling to London today to speak on crisis preganancy counselling at the Linacre Ethics Forum. These meetings are a chance for junior healthcare professionals and students to explore and discuss Catholic healthcare ethics. They are designed to help them reach a deeper understanding of the Church’s teaching, and explore ways in which it can be sympathetically presented to patients, colleagues and managers. The meeting starts at 6.30pm (for 7pm) and will take place in Vaughan House, Francis Street, SW1P 1QN (behind Westminster Cathedral, near Victoria tube station). More on information Linacre Ethics Forum is available here. THE Holy Father has asked Catholics to pray for the Church in China. Chinese Catholics joined the rest of the world in praying for the Church in China, according to invocation contained in Benedict XVI’s 2007 letter, to celebrate a World Day of Prayer for the Church in China on May 24, the feast day of Our Lady of Sheshan (Shanghai). The US government has largely sided with the Vatican’s argument that a court erred in a closely watched lawsuit alleging sexual abuse by a former priest, a rare foray by Washington into the highly sensitive litigation. One of Pope Benedict’s closest advisors was in Liverpool at the weekend. Cardinal Walter Kasper celebrated Solemn Mass at the Metropolitan Cathedral On Sunday. Pope Benedict XVI is urging the faithful to promote the bond between the Gospel and culture, affirming that Christ is good for society. He made the comments upon receiving, in separate audiences, leaders from Bulgaria and the Former Yugoslav Republic of Macedonia. “I am happy to be able to give each one of you a cordial welcome, honorable members of the official delegation, who have come to Rome in happy celebration of the liturgical memorial of Sts. Cyril and Methodius. Your presence, which attests to the Christian roots of the Bulgarian people, offers the propitious occasion to confirm my esteem for this dear nation and enables us to reinforce our friendship, enhanced by the devotion to the two brother saints of Thessalonica. “I welcome the opportunity to make a comment [on reports of Susan Boyle’s invitation to sing at the tomb of Padre Pio] since the Sunday Express did not afford me that courtesy [before it ran a report on May 23]. “I do not know the Sunday Express reporter Ben Borland, nor has he had the courtesy to contact me for comment. If he had, my response would have been ‘no comment’. Nor have I been in contact with anyone else from the Sunday Express newspaper. “I was incensed this morning to open that newspaper to see that I have been quoted as if he had spoken with me! “On examination, this Sunday Express article by Ben Borland has indeed been ‘pinched’ from the front page of the Scottish Catholic Observer. The Sunday Express is obviously having a slow news week and feels the need to resurrect and embellish a now old story! “The Scottish Catholic Observer correctly states that the Friar from San Giovanni Rotondo extended—in the presence of the small group that accompanied me—an invitation to Susan, to visit and sing at Padre Pio’s tomb. My understanding of this— and my hope—is that if this occurred, it would take the form of a private visit. I would most definitely go out of my way to ensure and safeguard Susan’s privacy. I would hardly call singing in a crypt holding 500 people a ‘concert’, particularly when a private visit would occur when the crypt is closed to the public. “As far as I am aware, there has been no ‘official’ invitation for anything, and I would also point out that Ben Borland is incorrect in assuming that the Friar mentioned has anything to do with the Vatican. The Vatican does not extend invitations on behalf of the Capuchin Order, and vice versa. “What a pity the press cannot leave this lovely lady in peace. I too, do not need the hassle in my life that this article is causing. English soccer team Manchester United star Wayne Rooney says he would have entered the priesthood if he hadn’t become a footballer. The Hermeneutic of Contunuity and Juventutem Scotland have both picked up on the news that a newly founded Sodality of Servers of the traditional Latin Mass (‘extraordinary form’) has been inaugurated. The Latin Mass Society is sponsoring a new sodality for altar servers who serve the classical form of the Roman Rite. Cross Wires can see why supporting and educating altar servers in the Latin Mass is a natural way of supporting the celebration of the traditional Roman Rite itself but also wonders if there is not also a need for a broader group supporting all altar servers, and the often overlooked work the they do for the Church. Nicolaus Copernicus, the 16th-century astronomer whose findings were condemned by the Catholic Church as heretical, was reburied by Polish priests as a hero this weekend, AP reports. You are currently browsing the Cross Wires blog archives for May, 2010.